Don’t think that Mac users are maligned all the time when it comes to hardware and software – that is not the case but merely an illusion. 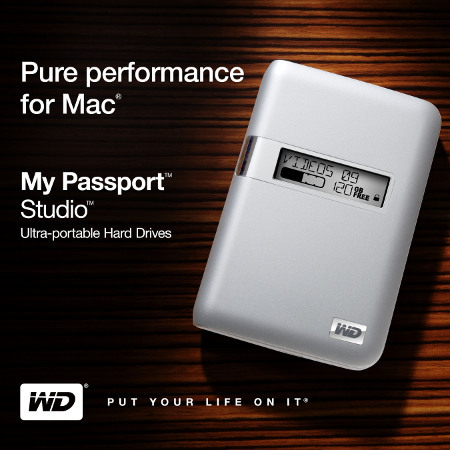 Today, we bring you news of the Western Digital My Passport Studio portable drive for the Mac platform which by virtue also makes it compatible with the Apple TimeMachine software, boasting automatic and continuous backup with WD SmartWare software and is aided by 256-bit hardware-based encryption for that added peace of mind. Of course, depending on your needs and budget, you will be able to pick up the new My Passport Studio drives in 320GB, 500GB and 640GB capacities. Targeting creative professionals as well as Mac enthusiasts, the new WD My Passport Studio drives are able to deliver fast transfers of large files from the computer to the My Passport Studio drive itself thanks to a speedy FireWire 800 connection. For others such as photographers, they also reap the rewards of such a device thanks to an e-labeling system that makes it much more effective when it comes to work organization. It doesn’t matter how fickle minded you are – the e-label smart display on the front of the My Passport drive is changeable as often as you like thanks to the bundled WD SmartWare software. You are able to churn out a label to personalize your drive or remind yourself of what it contains at a glance, while showing off additional crucial information like remaining space left as well as the lock status of the drive. Since e-paper technology is used, all information remains visible and legible even in the absence of a power supply. Security-wise, the My Passport Studio drive ships with user-selected password protection for added security alongside 256-bit hardware-based encryption, where the latter scrambles files before they are stored. This encryption ability is normally found in more expensive drive systems, so you can be sure that your dollar is being stretched to the limit here. Depending on the capacity of your choice, the new My Passport Studio drive will start from $149.99 and go all the way to $199.99, where each purchase is accompanied by a 3-year limited warranty.